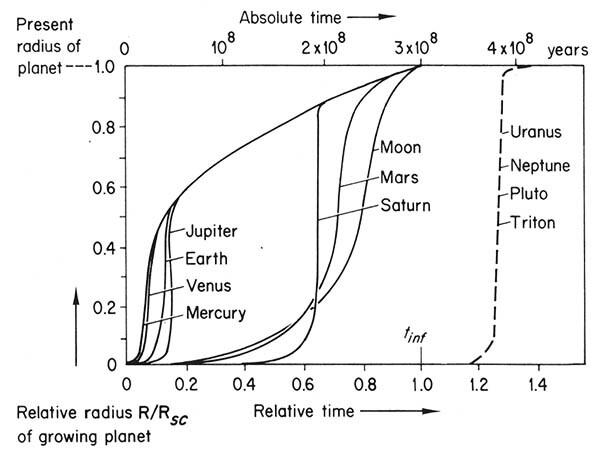 FIGURE 12.9.1.-The growth of planetary radii with respect to time. Runaway accretion occurs early for Mercury, Venus, Earth, and Jupiter. The time of runaway accretion approaches that of the duration of mass infall for Saturn, Mars, and the Moon. (From Ip, 1974c.) For Uranus, Neptune, Pluto, and Triton, runaway accretion occurs only after infall has ceased and the jet stream has contracted due to negative diffusion; this growth is schematically represented by the dashed curve.